This post is by my guestblogger, Jailhouse Lawyer. One year the gulf war broke out just before I flew. And then there was all that extra security over tube bombings which had happened just before I flew. To top that one off someone was late for the flight and only arrived with minutes to spare and lets just say when they eventually arrived they were not white. Cherrypie: LOL. The banner was not politically correct, but it gave me a laugh. Thanks, John - didn't expect it. "Alleged"? "Alleged"!!! He was given a fair trial and convicted and has now dropped his appeal. So what's with the alleged? And if he didn't do it, why was he greeted as a hero on his return to Libya. Is he a hero for NOT doing it? Fie, James. He was convicted. He's a convicted bomber. Just because the UN observer, the academic who set up the trial and a substantial number of the bereaved families do not believe it was a fair trial; just because they believe he is innocent, doesn't mean he is an "alleged" bomber. He is a convicted bomber. Gentlemen, if you look closely, you'll see that this is a guest post by Jailhouse Lawyer, not me. I'll be weighing into this one over the weekend - too angry, and not enough time to do so today. Something of a Scottish solicitor's perspective on it. Girls, don't get your knickers in a twist. The alleged in this post relates to my view that the man getting on board the plane is not the man convicted of the Lockerbie bombing. I am not convinced, in any event, that the conviction on circumstantial evidence and the witness receiving £2M reward money makes for the truth to emerge in this case. I don't beleive he is guilty. Just because someone os 'convicted' does not mean they are guilty. He was given the chance to go and die at home but only if he dropped his appeal. I find this trade off speaks volumes. I agree that being convicted does not necessarily make one guilty, only in the eyes of the law. Many people have been wrongly convicted. However, if one is truly innocent and he was appealing his conviction, to give up his appeal to die at home, would not be enough. I would rather die protesting my innocence in a jail than wallowing in misplaced adulation the he now receives. IF he is guilty, he should rot in hell. James: Definitely a hornets nest this one. 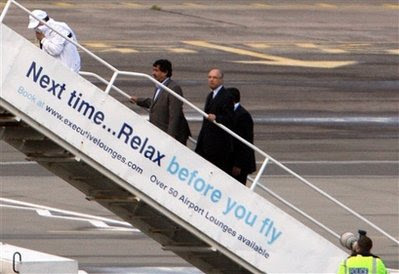 The post was meant to highlight the inappropriateness of the banner on the plane steps. What kind of message does this send given the subject matter? I'll relax when terrorism is vanquished, which will be never, due to the bleeding hearts for these maniacal murderers. Islamic terrorists nearly killed me (the poor gent 20 feet from me died from the blast); they killed a member of my family, and killed many former friends on 9/11. Nunya- If you really think about it , I think you might consider at the end of your life what would take priority, sepnding your last months on earth with loved ones and saying your good byes or what people thought of you after you were gone? What does speak volumes was that he had to drop his appeal in order to have his last good byes and die in peace and with dignity and love. An astonishing number of people are convicted everyday who are innocent. Why did they let him out at all? Most convicts serving time,. especially ocnvicted of such unspeakable acts do not get the opportunity to die at home. This smacks of an inducement to silence.